Time is moving fast! It seems like we were just celebrating Valentines Day and here it is almost May! Kids will be out for summer vacations, baseball season is here, and there are so many fun things to do in the summer with our families. 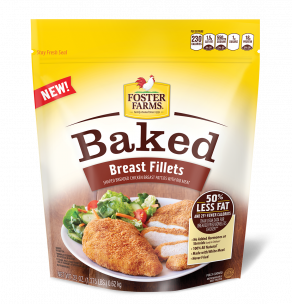 We already trust Foster Farms to bring us the quality, great chicken products and now they have found a way to get rid of the fried and bring on the Baked! My family all love the taste of crispy, breaded chicken, however we all know that it is not the best for our bodies, and now with the Baked products we can have the flavor and texture we love, with less guilt. All Foster Farms chicken are 100% all natural chicken with no added hormones or steroids. This new product from them is made with white meat and of course are Baked NEVER fried. Because they’re fully-cooked you just take them out of the freezer and heat and serve in under 12 minutes in the oven, or 2-3 minutes in a microwave. I made this one of the easiest dinners ever and just served it with some mac and cheese! The chicken was amazing, not dry at all, and we just used some ranch and bar be que sauce on the side. The chicken was filling and great tasting! Kids are going to love these new BAKED Chicken products. My picky husband even loved them! Keep in touch with Foster Farms and follow them on their social media, they often share recipes and coupons!